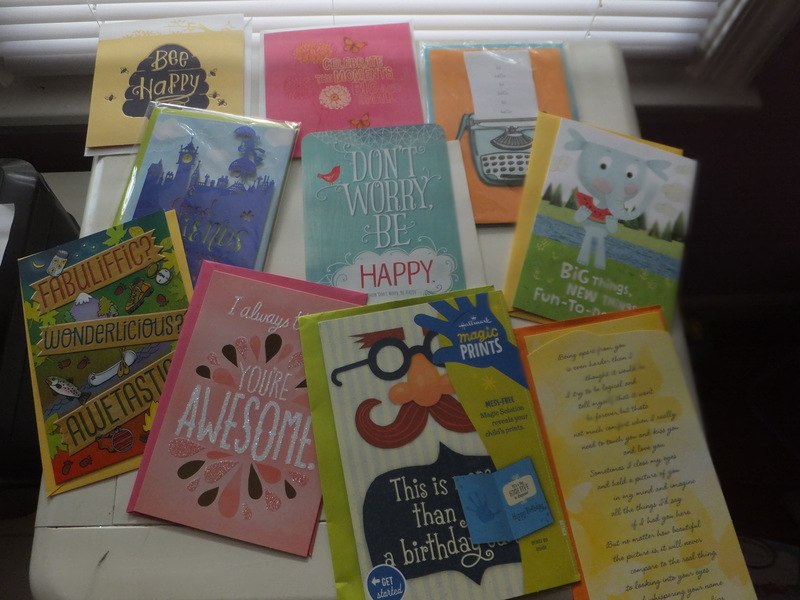 Hallmark sent me 10 greeting cards to participate in their Get Carded Challenge. I had to send out 7 of the cards in 7 days to whomever I wanted to. I sent them out to friends and family and received some great feedback! Use code BLOG30 on Hallmark.com to get 30% off greeting cards through the end of the year. Hallmark would like to send one of you a package of greeting cards. Comment below with a couple of people you might send cards to, along with your email address and I will choose 1 winner at random a week from now. If you are a blogger you can sign up too! Click here to see if you meet the criteria. I would love to send a card to my parents, mother in law, daughter, son, several friends from church who could use a little encouragement right now and my two aunts. I would send them to all of my girlfriends who live far away and I dont keep in touch with like I shoud.. I would send them to all my loved ones who live in another state. I would send cards to my nephews! I would love to send card to each of my close friends who live across the country. I miss them terribly! I would also send cards to my husband’s family since they live in GA.
Grandparents! Mine and my husbands, and include recent pics of our 15 month old. I would send them to my grandparents in Florida. Also, we have quite a few family birthdays coming up at the end of the year. I would send a card to my friend who just moved to Tennessee and have my kids send one to their great grandpa. I would love to send to my mom in Ohio andmy Aunt in Florida. I would love to send a send…or more…to my best friend. She lives in another city and we don’t see each other much but she often sends me just because cards that are often handmade…I’m not that crafty! She is my inspiration and keeps me going with her thoughts and prayers that she sends. I want to do the same for her! I love snail mail! I would send cards to an older lady in Texas who has been like an aunt to me. She is very lonely and I enjoy brightening her day with mail. I would also write to my college roommate. She is dear to me but we have not seen each other in years, due to the many miles between our homes. Thanks for the opportunity! I would like to send a card to my former pastor and to my nephews! I would like to send them to my daughters who now live on opposite sides of the country and my best best buddy who moved away. I would send the cards to my students. I teach Graphic Design to high school students and it’s incredible how teenagers have lost the joy of simple things, like receiving a card via regular mail. This would brighten their day!! I would send a card to my mom who is very ill, my great-grandmother, and a couple close friends. The teams were each down a man when Raphael Diaz sent a pass to Eller for a goal at 10:08. Toronto was caught on a 3-on-1 when Montreal got the puck behind Carl Gunnarsson, and Eller fed Gallagher at 13:54. You just need to select the city in which you want to send the flower and then you need to select which flower combinations you like. * The first and foremost step in contemplating such a loan is to order a credit report. internet-site through PPC advertising and search engine marketing guide. Businesses houses are keen to maintain their online presence. will help you to make your decision about article writing and posting.